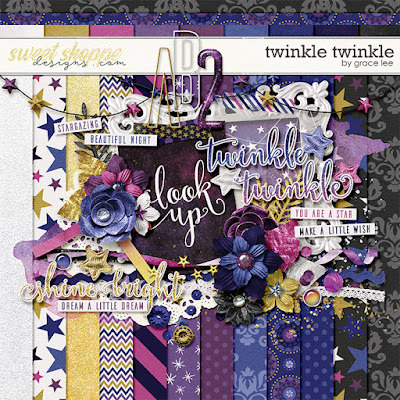 Twinkle Twinkle is a kit inspired by the starry skies. When we look up into the far galaxies at night, it is impossible to not feel an overwhelming sense of awe and wonder. This kit recreates the beauty and mystery of the start of night with shades of blue, purple and gold, with lots of shimmer and glitter that will make your layout shine! It's a versatile kit that can be used for any dreamy photos! and 49 elements. The elements included are: 2 banners, 1 bow, 2 brads, 3 buttons, 1 doily, 7 flowers, 1 frame, 2 journal cards, 1 lace, 5 foliage, 3 paint, 2 ribbons, 1 ricrac, 3 scatters, 5 stars, 3 washi tape, and 7 word art.